This weekend I managed to sew up part of my first Meringue skirt. I wasn’t too sure about the fabric at first, but to my surprise I am really liking the look of it so far. It’s a fairly heavy fabric, so it should hold the scallops nicely. Take out 2cm total at the waist. (0.5 cm on each of the darts). Add a little bit of room between my waist and my hips. 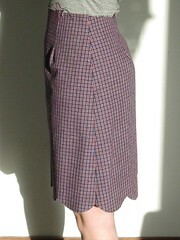 It has a tendency to pucker around my belly a bit because the skirt is a little tight there and wants to creep up. Have a good look at the darts. As you can see in this side view They don’t really lie nicely at the points. I don’t know if it’s a problem with the darts, the fabric, my stitching or my pressing, but I hope to remedy it on a next version. Not fit related, but I’m planning to make pockets and a waistband on the next version as well. 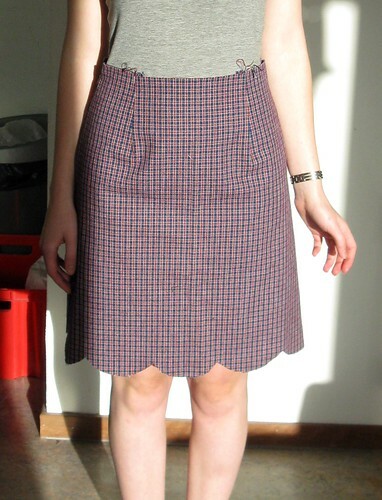 Any interest in a tutorial on adding pockets to a basic skirt? Speaking of tutorials, stay tuned for a tutorial on adding a lining to the Meringue skirt. I have taken practically all the pictures, so I hope to find some time to write it up before I leave for Paris on Thursday! Looks great! (I’ve been wondering what this might look like in a plaid!) It’s very helpful to hear about the sorts of changes you’re making, since I’m very, very new to altering patterns for fit. The more I can read about it, the better! I would be doubly interested in jeans pockets! I love the look of them on skirts! ooohhh…I love your fabric choice!!! It looks great in plaid! I wonder if you made the darts a little bit longer, would they sit better? I still haven’t sewn my muslin…I’m getting there but I haven’t quite made myself sit down and sew it. I think I need to find myself a sloper though, because I have a feeling swayback might be the reason why my waistbands never sit quite right.. Looking forward to the lining tutorial! thanks for the post, I was wondering about the sizing and, after making a muslin, realized the pattern is true to size. So, I am going with size 8, although other patterns from Colette worked best with size 6 :-) So, good to have a muslin made! Are you planning to do a waistband? Thanks for the suggestion! I finished this one as-is, and it’s well wearable, but on the next one I’m definitely making the darts a tad longer, take out a bit at the waist and make a waistband.